For clients with developmental disabilities, an important goal of art therapy is to foster successful art making experiences they can subsequently feel proud of. I am flexible during 1:1 or group art therapy sessions, allowing the clients to choose what they would like to work on, while keeping my ears and eyes open for any suggestions they may have for art projects they would like to work on in the future. So, when a client happened to mention how she used to watch her mother sew dolls when she was a child, I asked her (and later the group) if they’d like to begin a sewing project. The group, which is mainly young females in their early 20s, enthusiastically replied “yes”- especially after they began to see some of the projects their peers were working on. I am hoping that in the future I’ll have some photos to put alongside this post, which may help following my instructions a little easier. – Clients chose which they would like to work on; a pillow or a doll. – If the client does not have the fine motor skills to use a regular sewing needle (for example if the client has cerebral palsy), or if the client may become self injurious with the needle, I offered to punch small holes along the edge of the felt so that they could sew using a plastic needle and thread. – For clients that were comfortable using a needle, I reviewed threading and how to make a running stitch, practicing on a test piece of felt. – Clients making a pillow chose 2 pieces of rectangular felt. They were asked if they wanted to embroider a design on their pillow. If they said yes, I asked them to draw an outline on one piece of felt using a dark colored pencil. Then, using the running stitch (or an embroidery stitch) the client sewed along the outline they created. After the design is complete, the client can begin sewing their 2 pieces of fabric together into a pillow. Remind the clients to leave one side unsewn so that the pillow can be stuffed and sewn closed. – For clients making a doll, I begin by asking them to make a sketch of what they would like their doll to look like. -Many DD clients have low frustration tolerance, and difficulty cutting accurately. Since one of the goals is to make this project successful, I suggest the therapist cut the shapes needed for the head, body, arms and legs for the client, allowing the client to focus on the task of sewing and stuffing. This helps the project to be less overwhelming for some. However, higher functioning clients (especially adolescents who are trying to master separation and individuation) may ask that the therapist not help. In this case, respect the client’s wishes, while reminding them that you are there if they have any questions. – Most clients opt to begin with the head. I have multicultural skin toned felt, which is great for the head, hands and feet. I precut 2 circles for the client, in the color of their choice, to be sewn together as the head. 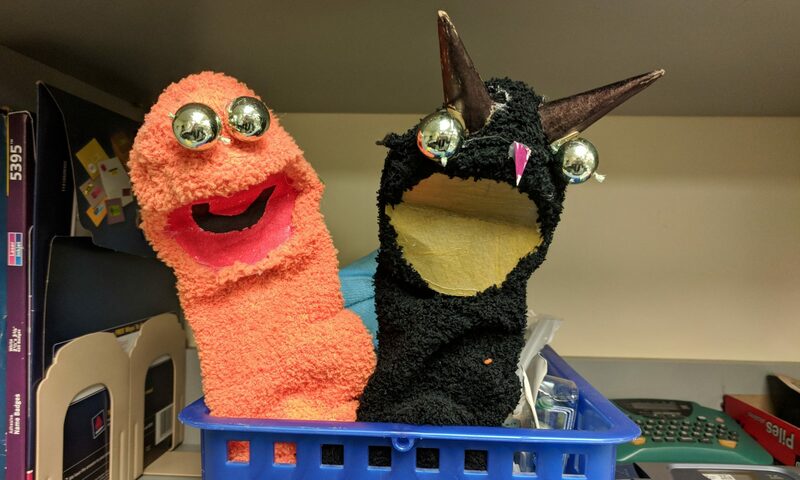 However, before the sewing begins, I suggested to the clients that they may want to work on the face, for example, by sewing on buttons for eyes or gluing yarn for a mouth. Once the face is completed, the 2 round felt pieces can be sewn together, again, leaving an unsewn part to stuff the fluff into and then close. Hair can be added by gluing pieces of yarn on the finished head with some fabric glue. – While the client works on the head, the therapist can cut 2 pieces of felt intended to be the body according to what the client has drawn in their sketch. This may be a simple shape, such as a triangle or rectangle, or it may be more complex, like a dress that has a neck, shoulders and arms. They may want to choose felt of a different color so they body looks like clothes. Again, the client will sew the 2 pieces of felt together, leaving an unsewn part to stuff. Before the stuffing takes place, the client may want to add a pipe cleaner (folded into a “w” shape) into the body, so that it acts like a spine- holding the doll in place. Once the pipe cleaner is inserted, the client can stuff and close. – For simplicity’s sake, I opted to not have 3 dimensional arms and feet, but rather cut one piece of felt into the hands and legs of the doll. – The client can now sew the head to the body, as well as the arms and legs. Tip– For the pillows/dolls made by clients who did not sew their piece well enough to last (it looks like it will fall apart), the therapist may ask if the client would like some extra reinforcing sewing to be done by the therapist so the pieces will last longer. While many DD clients are excellent sewers, some are not. Helping to support the longevity of a project that the clients intend to keep over the long term because they are proud of their piece, can be validating to the client and demonstrate that their work, ideas and creativity is valued. This is an ongoing project, so there will be no doubt more information about this directive to come. In any case, here are some interesting dynamics that have surfaced so far with the individuals participating in group art therapy 4x per week (sessions are voluntarily attended, so many do not participate as much as this). All information shared is in generalities to protect the identities of the clients. – As the group members sewed, almost immediately a discussion began about mom’s. It seems that many of these clients were taught to sew by their mothers or maternal figures, and the act of sewing itself evoked strong memories of their mothers. – Many of the clients who chose to create a doll are in the process of working through body image issues. Doll making may open another avenue of exploring such issues with the therapist. – The participants are proud of their work, and proud that they were able to remember or learn new skills. – Many clients remarked on how relaxing hand sewing is, and wanted to create more than one piece. – Some clients wanted to use their own fabric, for example from old clothes, to make their pieces. In many of these instances the fabric used were from clothes that have meaning to the client. For example, one client saved a hospital robe from a involuntary psychiatric hospitalization, and used this robe to make a pillow as a reminder to herself that she does not want to be involuntarily hospitalized again. I’m an art therapy student so I’m constantly exploring different art interventions and ideas. I just started making a pillow with a girl who self-mutilates and was so interested to read what you wrote about the sewing. I’ve done all sorts of other projects, but the pillow making project has been incredibly powerful for her as well. I’d love to hear more, great site! Recently, I started making a “quilt” with the clients I work with, where they choose a color for their felt square and a symbol or phrase that represents themselves. They use marker (ideally permanent so it doesn’t rub off easily) to make their drawing and then embroider their work. If they need help embroidering or can’t sew, I sew for them, but with as much input as possible from the client (what color thread? should the line start here? what stitch?) Once everyone in the facility has done their felt rectangle (approx 30 clients), the rectangles will we sewed together into a big wall hanging, which will go into one of the group rooms. Those who are actively involved in the art group will help decide on the layout of the “quilt” (which fabric square goes where) and where the quilt should be hung. Liz, I came apon your post exactly 3 years later. 3-13-12 were meaningful #’s today. My beautiful son is 19 and has autism. His disability weighs heavily on me every day. Tonight I decided to google art therapy for dev.dis. hoping to give him another avenue of communication and me another avenue to reach him and help him grow. You are making a big difference in this world. Thank you. Thank you Barbara! I’m so glad you stopped by and I hope your son finds art making to be a successful avenue for self-expression and communication.